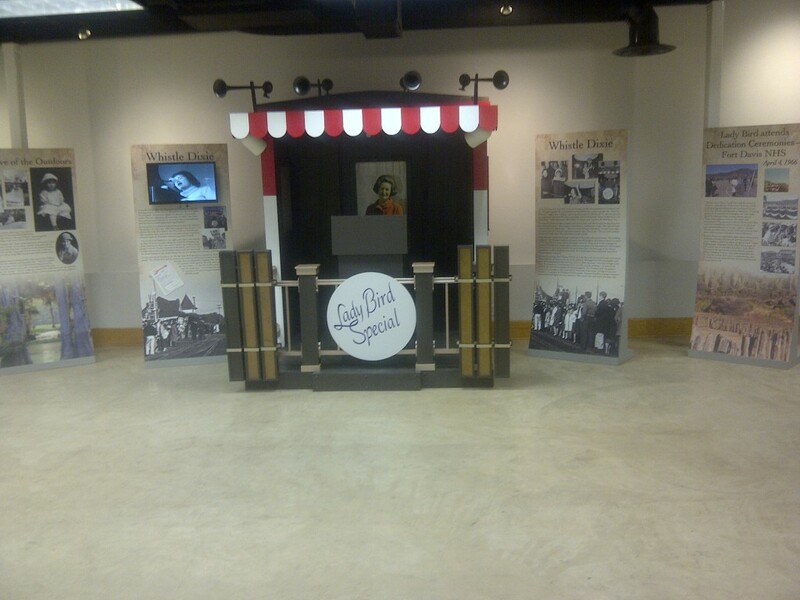 The LBJ Museum of San Marcos would like to announce the opening of the new Lady Bird Johnson Exhibit on the 2nd floor of the museum. 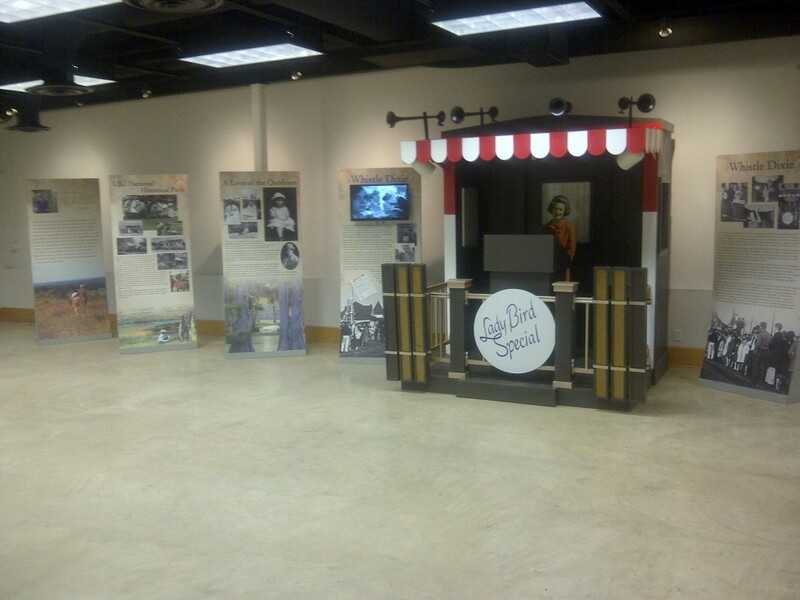 The Exhibit features a replica of the caboose of the “Lady Bird Special” that was used by Mrs. Johnson on what became known as the “Whistlestop Campaign Tour.” Mrs. Johnson became the first wife of a President to campaign by herself for her husband. The train traveled 1,682 miles in four days on a train dubbed the “Lady Bird Special” making 28 stops from Alexandria, Virginia, to New Orleans, Louisiana. Mrs. Johnson wanted to campaign there because President Johnson’s civil rights legislative agenda was unpopular in the South. She explained her reasons in a speech to the crowd as she departed Alexandria, “I want to tell you from Alexandria to New Orleans that to this President and his wife the South is a respected and valued and beloved part of the country. I know that many of you do not agree with the Civil Rights Bill or with the President’s support of it, but I do know the South respects candor and courage and I believe he has shown both.” She endured a lot of heckling during the tour. The caboose was created by Mr. Cecil Brown of Johnson City from photos of the actual train. 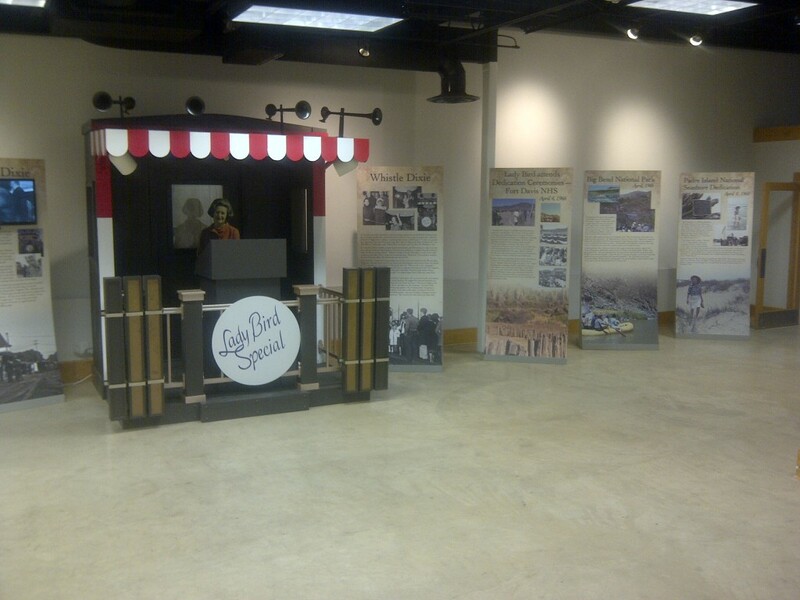 The Exhibit also displays the significant impact that the former first lady had on our National Parks. The Museum would also like to extend a special thank you to the National Park Service and the LBJ Historic National Park at Johnson City in particular for donating this Exhibit to them. Specifically they would like to thank Mr. Russ Whitlock, Superintendent of the Park. Additionally they would like to thank Becca Renaud, NPS, Mr. Brown and Mr. Michael O’Neil of Wimberley for donating their time to break the exhibit down and set it back up for the enjoyment of the Citizens of San Marcos and visitors to the museum. The Museum would also like to thank Karl and Cathy Grimes of AAA Self Storage and U-Haul for assisting with transportation to move the wonderful Exhibit to its new home. Dr. Ed Mihalkanin, President of the Museum said the public is invited to stop by and take in this wonderful new Exhibit starting Thursday, April 10th, 2014.